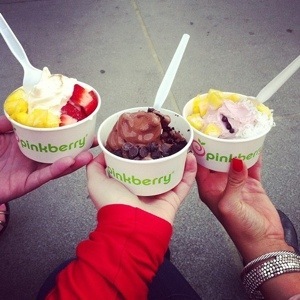 What else is there to say about Pinkberry? It’s delicious and everyone knows it. You pick the size, the flavor yogurt (Greek or frozen), and then your toppings. I can’t steer away from my usual chocolate froyo with all chocolate toppings while everyone else seems to go the fruit route. I don’t think I/anyone else I’ve gone with has ever left unsatisfied. This entry was posted in Fairfield and tagged Fairfield, food, froyo, frozen yogurt, ice cream, Pinkberry. Bookmark the permalink.